Time for another mini update. Have re-scaped a little and moved some of the Alternanthera reineckii to the midground on the right. 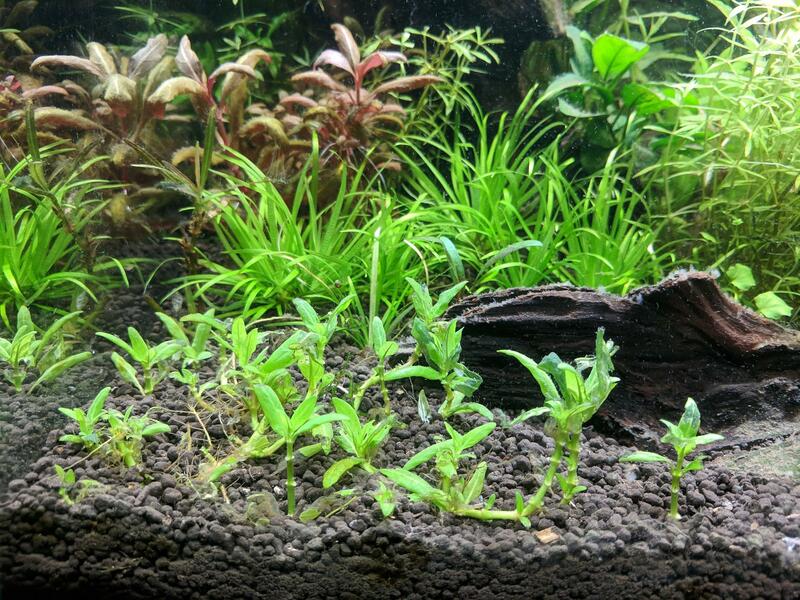 Have also moved the Limnophila mini Vietnam and Limnophila repens mini to groups in the midground so that the foreground can be exclusively for the S repens and S Porto Velho that I'm trying to get to carpet. The blyxa is starting to bounce back after basically melting to nothing. Have now gone through 2 cycles of the recommended 3 day cycle for no planaria. Pond snails seem to be dead on the substrate, but as expected ramshorn snails are still going around. I plan on doing one last 3 day cycle just to make sure. 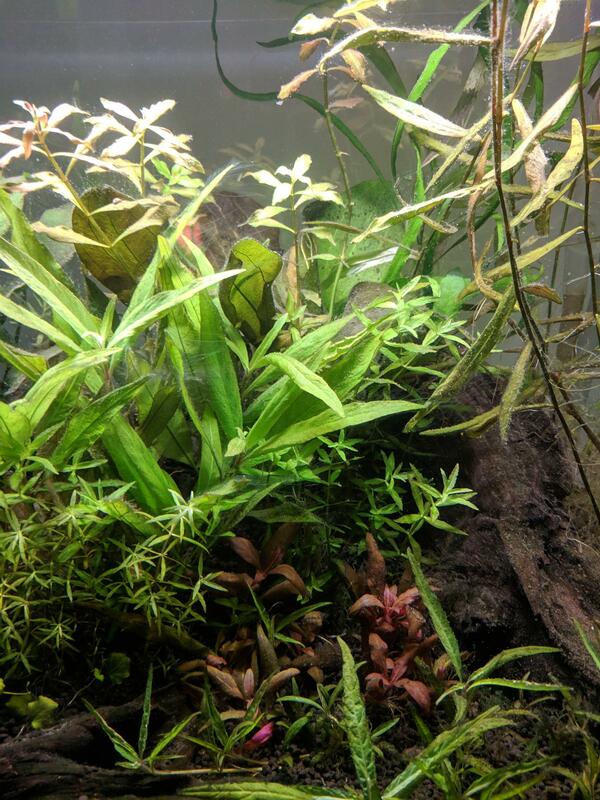 As for the algae issues, I've chopped away a lot of the affected leaves but there is still green beard/hair algae on many plants and the substrate. I've ensured no natural light is getting onto the tank and have reduced light duration and intensity for the time being. 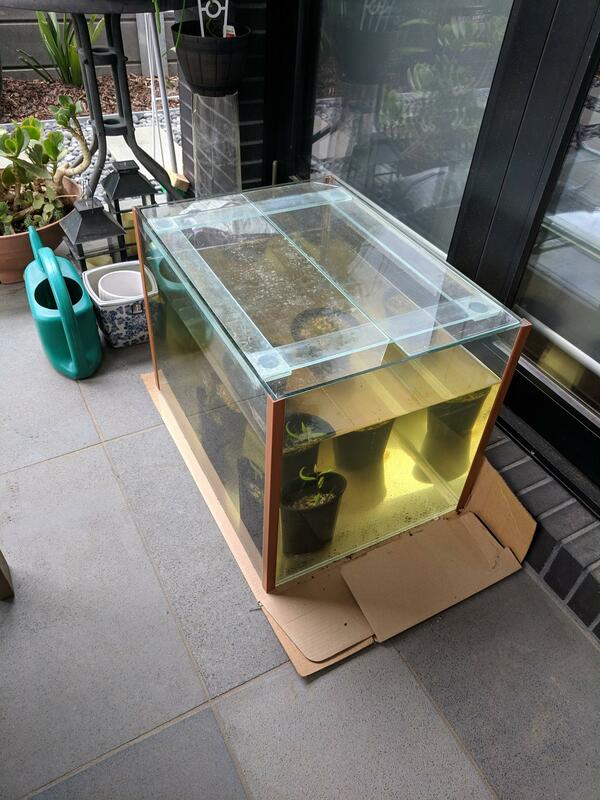 Once the last cycle of no planaria is done, I will pump up the co2 a little and start re-dosing fertilisers so that the plants can get on top of the algae. I terms of scape I am going to take out the Echinodorus rose. It's just too big and clumsy in this scape. Going to also move the emerald heart anubias that is high up on the driftwood to a lower spot so the light isn't intense and it hopefully get's some shade to prevent algae growth. Also think I'm going to take out most of the Persicaria sp sao Paolo. It looks messy on the right hand side and I don't like the look of the root system. 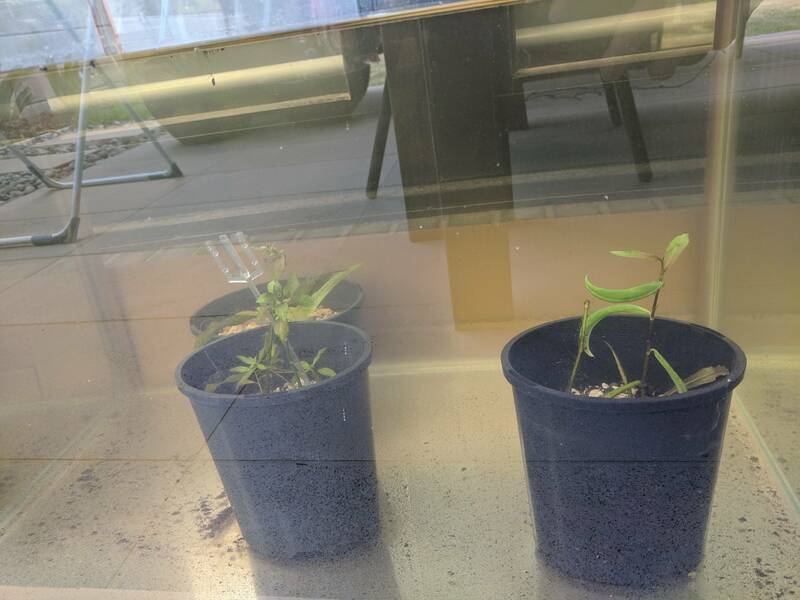 Both will be potted and put in my outdoor grow out tank (potting soil, with osmocote pellets and capped with gravel). 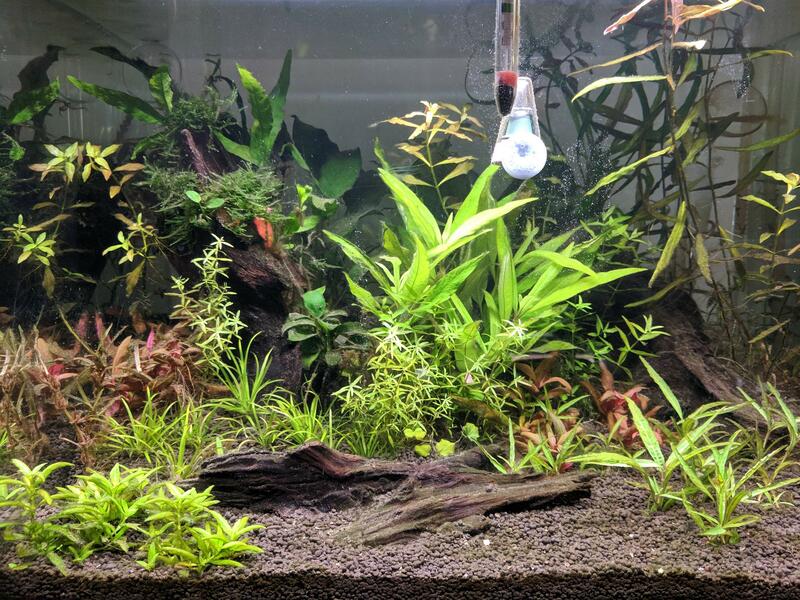 I think I'll move the hygro pinnafitida to the right hand spot now so it can grow properly (it's in the shadows of the driftwood on the left at the moment). Haven't checked water parameters for ages, not in a rush to stock, rather get on top of the snail and algae situation first. Mini update: bought an ebay glass surface skimmer. It looks exactly like the one in the evolution aqua glasswork set but at a fraction of the cost. After an hour or two happy to report that all surface scum is gone. Very happy with the results. Flourish excel also came in the mail and I have spot dosed some algae spots to see what the outcome will be. Pond snails seems to have gone but mini ramshorn snails are growing in population. 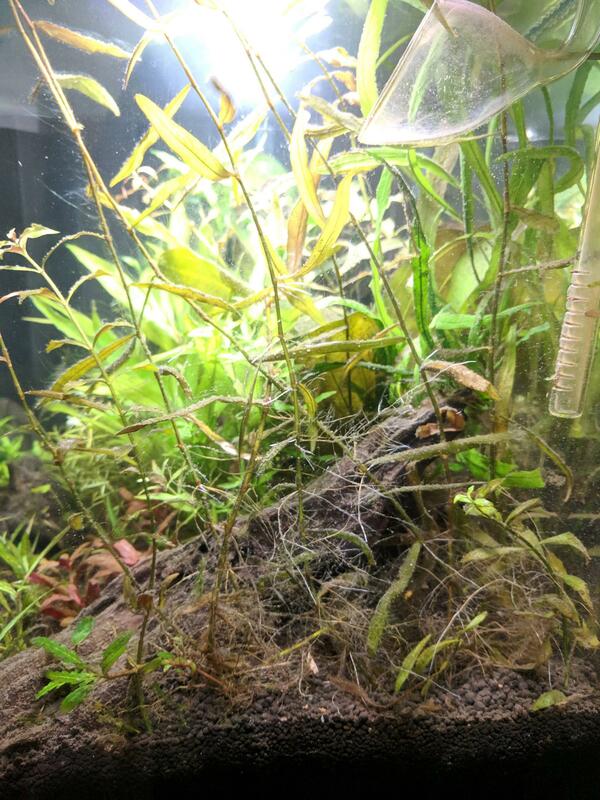 Not sure how to deal with them, but I'm leaning towards biting the bullet and going with yoyo loaches. Would have to cross my fingers and hope they don't go around digging up my step plants, but think I might be willing to risk it. They are illegal in Australia from what I understand. Just trying to do regular (every 2-3 day) siphons of detritus at the moment to reduce the food source for snails. I'm squishing what's visible and numbers are holding steady for now. Trying to collect hair/thread algae with a toothbrush but it is still very tedious. Spot dosing 15ml flourish Excel for 100L tank daily with filter off for 15 minutes. Slowly seeing results. Finally stocked with 9 black neons (LFS didn't bag 10). Algae is under control but still present. 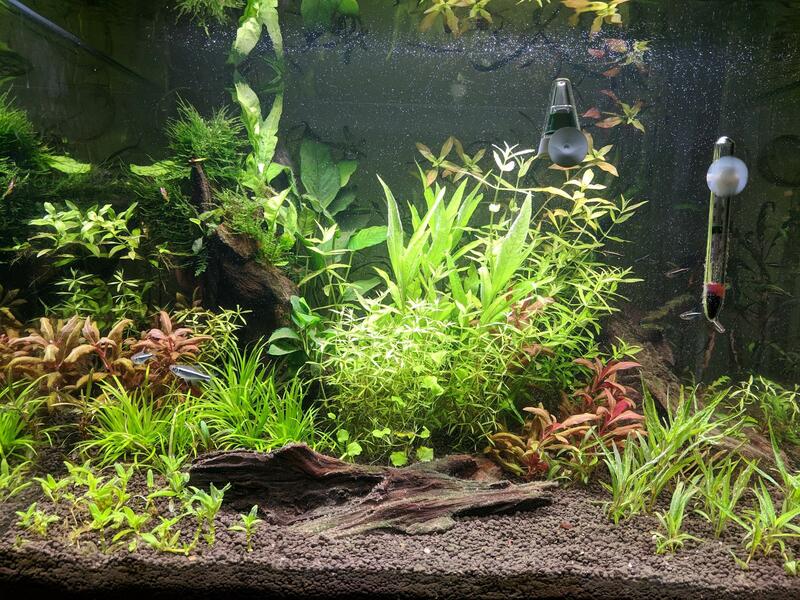 Plants seem to be doing well, but S. Repens has melted away heavily after excel spot dosing. Should bounce back no problem though. What are you feeding the fish? They might be skittish but will still eat usually. I'd say feed and move away from the tank, or stand infront and dont move for a few minutes and theyll come out to eat what you dropped in the water. Possibly trying live foods might help trigger them to eat. 1. live foods with filter off. 4. feed at exactly the same spot every day to encourage them to hang out there. I concur with above. In addition I would consider adding shrimp now. In my experience tanks with shrimp are better all round. They provide a certain amount of live food and food leftovers as well as algae are better managed. If you are not into shrimp at all it still is worthwhile. I bought 150 glass shrimp for 20$ the other day. 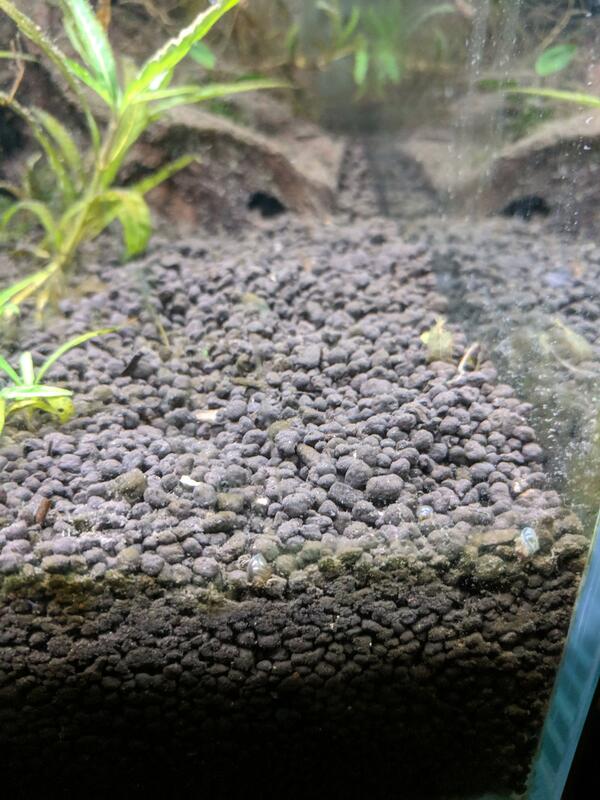 My shrimp had died out in some tanks after I moved house and started tanks from scratch and the ones where the shrimp held on are generally in better shape now. As far as starvation is concerned I wouldn't worry. If they get really hungry they will eat. Thanks for input. What live food is best for tetras? I've had black neons before and they were pigs. Different lfs this time so not sure if that's got anything to do with it. Hard to get dither fish for tetras but I was thinking of doubling the school to see if that makes them feel safer. Not really into shrimp but I'll get some cheap ones to help control algae. I hoped on getting apistos but that's a long way off given I want to make sure the neons survive first. Doubling the school sounds like a good idea and yeah, some shrimp will be good for apistos to snack on. I keep apistos and the ones in the tanks with shrimp are looking better. All times are GMT +8. The time now is 07:14 PM.